Last week Apple unveiled its new MacBook Pro model and it came with new features and improvements. 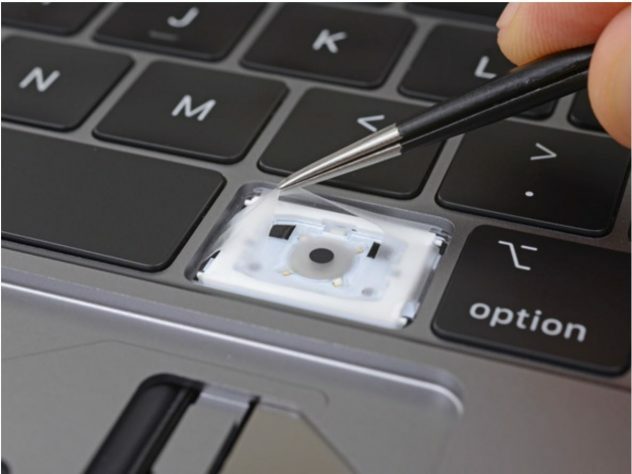 However, it looks like that the guys at iFixit discovered that the recently released 2018 MacBook Pro are surrounded by a “thin, silicone barrier.” This discovery suggests Apple’s third-generation “butterfly switch” keyboard wasn’t necessarily designed to be “quieter,” like Apple has claimed. Instead, it could have been designed to make it less prone to exposure to dust and other small particles. The bottom line. iFixit, like many others, doesn’t believe Apple will ever come out and admit, “Hey, we fixed it!” regardless of what further tests prove due to the lawsuit. Still, at least at this point, it does look like Apple might have done just that. With the most expensive MacBook Pro this year priced at just below $7,000, that’s nice to know, no? Besides a “quieter” keyboard, the latest MacBook Pro comes with up to a six-core processor, 32GB of RAM, and a True Tone display. There’s also an all-new leather sleeve for both the 13- and 15-inch models. Are you planning on buying the new Apple MacBook Pro 2018 or not?